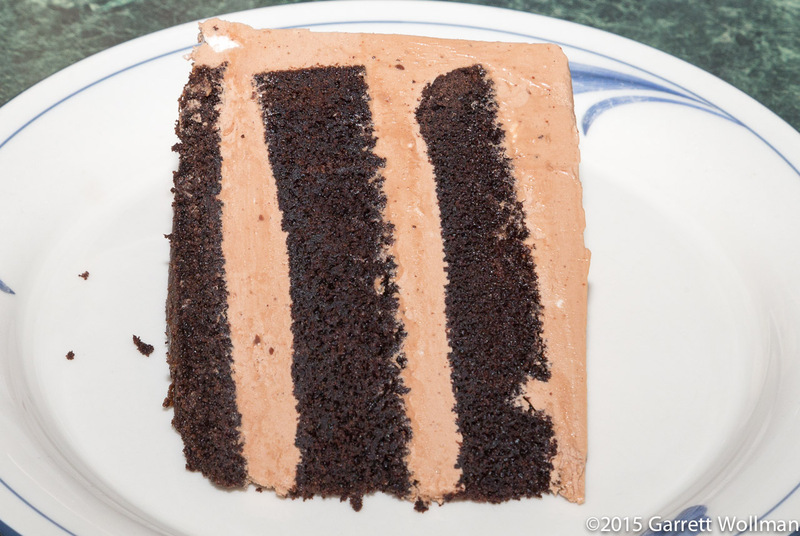 When I started my summer baking project last June, I did not expect one recipe to be head-and-shoulders more popular than all the others: Joanne Chang’s “Midnight Chocolate Cake with Milk Chocolate Buttercream” from Flour (Chronicle Books, 2010; p. 162). I had originally resisted doing this one, because when I first ran the nutrition figures it was off-the-charts unhealthy, but six people requested it, so when a three-day weekend eventually rolled around, I did it anyway. It turned out that the nutrition wasn’t quite as bad as I had thought — just “normal-for-layer-cake” bad, which is something I can live with on occasion. People were indeed wowed by it, although there were several issues that discerning tasters noticed (which I’ll get to in due course). This recipe involves several stages and subassemblies. The first of those, used to flavor the cake batter, is a chocolate slurry made from a cup (240 ml) of boiling water, 60 g of Dutch-process cocoa (I used my usual Valrhona), and 30 g of chopped unsweetened chocolate (I used Madécasse unsweetened chocolate discs, which are sold in bulk at my local Whole Foods). This is whisked to emulsify and then allowed to cool completely — Chang actually specifies four hours of cooling time — so I did this before going on my morning bike ride, and it was fully cooled by the time I was done with a shower and lunch. The remaining ingredients for the cake were (clockwise from top) 225 g of cake flour (I used the last of my Queen Guinevere <sniff> and made up the rest with King Arthur “Unbleached Cake Flour Blend”), 330 g of light brown sugar, half a teaspoon of kosher salt, a whole teaspoon of baking soda, two sticks (225 g) of unsalted butter, two eggs, and two egg yolks. Not shown here: 60 g of crème fraîche. 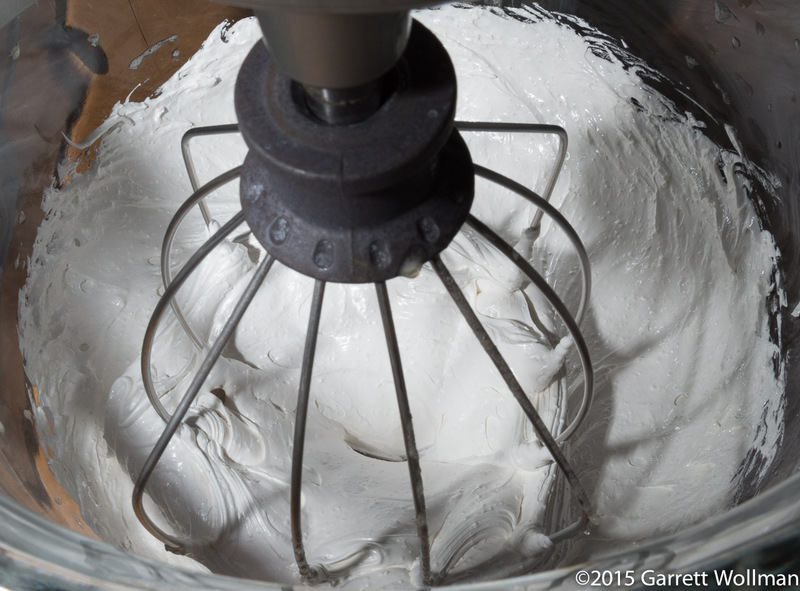 The egg whites were reserved for use in the buttercream. 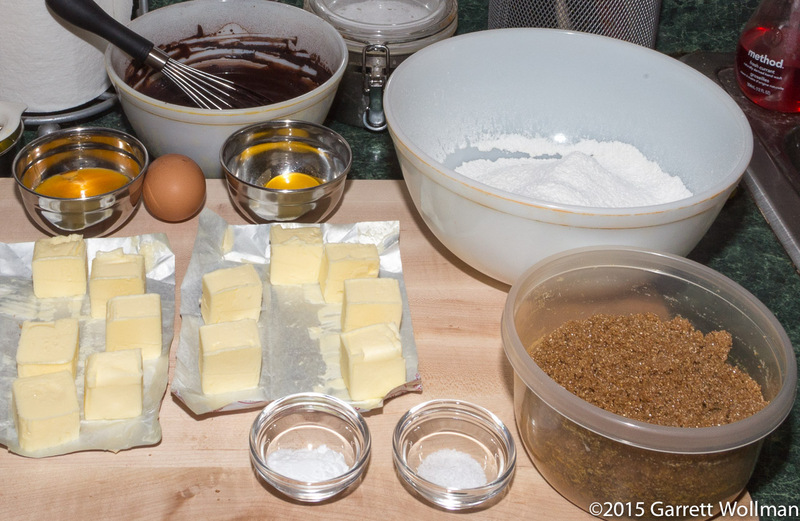 The chocolate cake batter is assembled using the reverse-creaming method: the dry ingredients and the sugar are mixed together, and then the softened butter is stirred in, rather like making a pâte sucrée pie dough. This works best in a stand mixer; the butter should be added slowly and allowed to incorporate, not dumped in all at once as you would with the regular creaming method. The eggs, egg yolks, and crème fraîche are whisked together in a separate bowl until smooth, then stirred into the dough mixture. 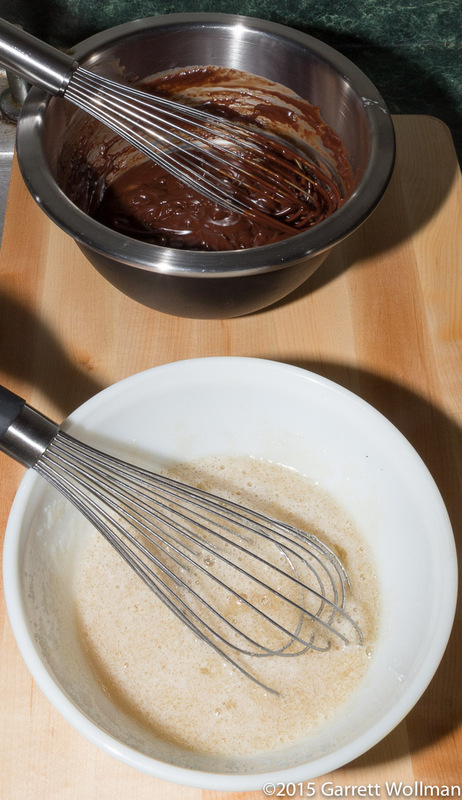 Once the egg mixture is fully integrated with the dough, the result is beaten for a couple of minutes to make a light and fluffy batter before adding the cool chocolate slurry. (Note that there’s no vanilla in this cake!) 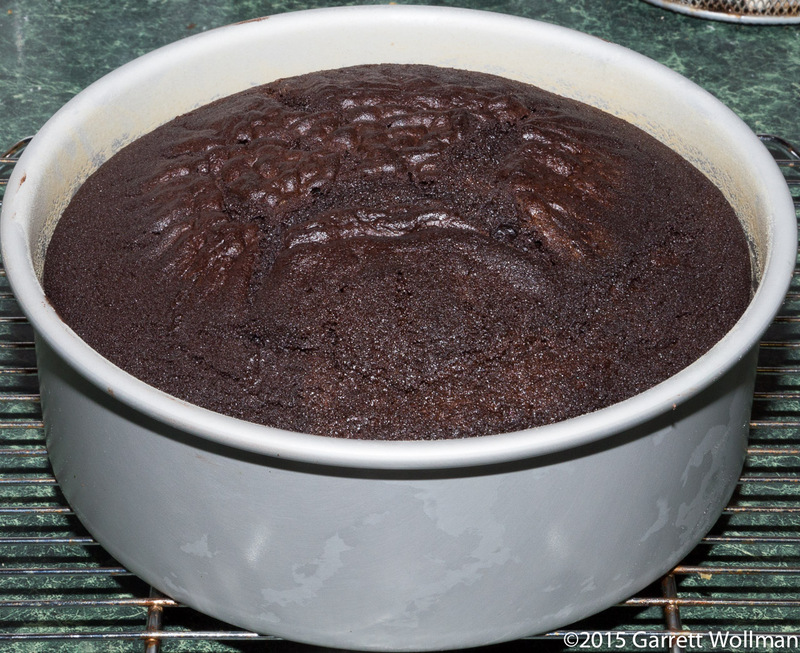 The cake is baked as a single layer in a 8″×3″ round baking pan — I had to go out and buy one, because my “eight-inch” springform is actually 7½″×2¾″, just a bit too small. I used the traditional pan-release treatment (first butter and then flour) rather than baking spray, so I didn’t use a parchment round on the bottom, either — luckily the bottom released with only minor damage, all of which would be hidden anyway. We move on to the buttercream. 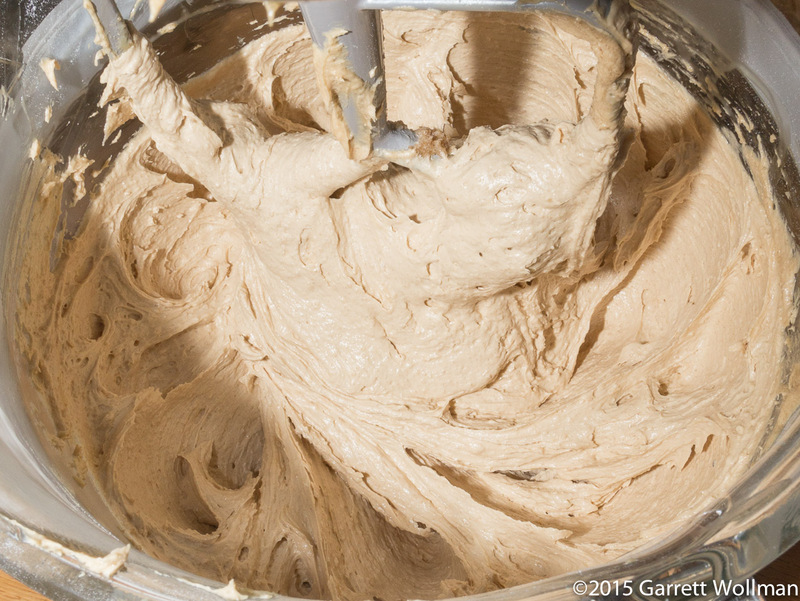 Chang’s buttercream is based on what’s called a “Swiss meringue”. The buttercream I normally do uses what’s known as an Italian meringue: it’s constructed by whipping a hot sugar syrup into a room-temperature egg-white foam, thereby cooking the eggs, and then continuing to whip until cool. A Swiss meringue, by contrast, mixes sugar and egg whites directly, without making a syrup, and then cooks the mixture in a double boiler before transferring to the stand mixer to whip until cool. Chang’s recipe is unfortunately a bit underspecified: she says to cook the meringue “until the mixture is hot to the touch”, which isn’t very helpful. Knowing a bit about food safety and also knowing that professional cooks and bakers tend to be much more heat-tolerant than I am, I decided to cook them to 160°F (72°C), which took rather longer than the suggested 4–6 minutes. 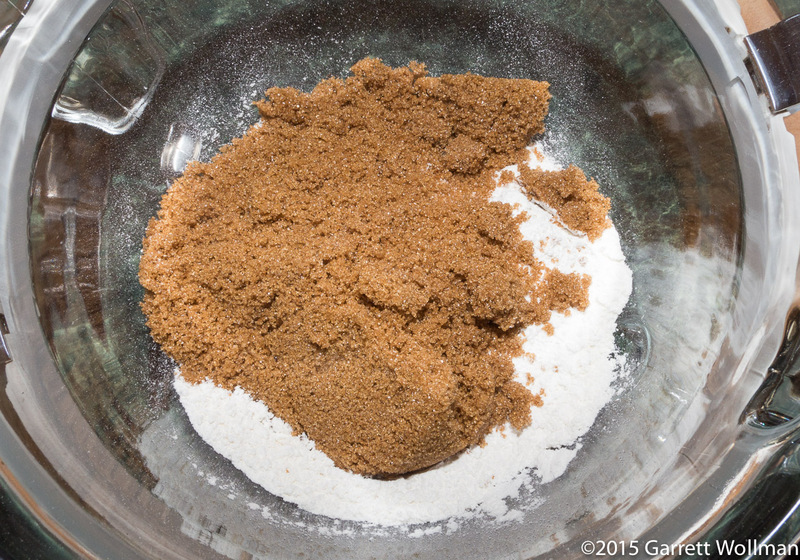 In the photo at right, you see the egg-white mixture before cooking; it consists of three egg whites whisked together with 300 g of granulated sugar. A number of the tasters commented on a gritty texture in the finished frosting, which makes me think that perhaps superfine sugar would have been a more appropriate choice. The other bowl contains a milk-chocolate ganache (12 oz or 340 g of TCHO 39% milk chocolate discs melted with half a cup — 120 ml — of scalded heavy cream), which has been allowed to cool for an hour on the countertop. Just as with the Italian meringue, the cooked Swiss meringue is whipped until fully cool on the stand mixer, giving it a glossy white appearance and a texture reminiscent of melted marshmallow. 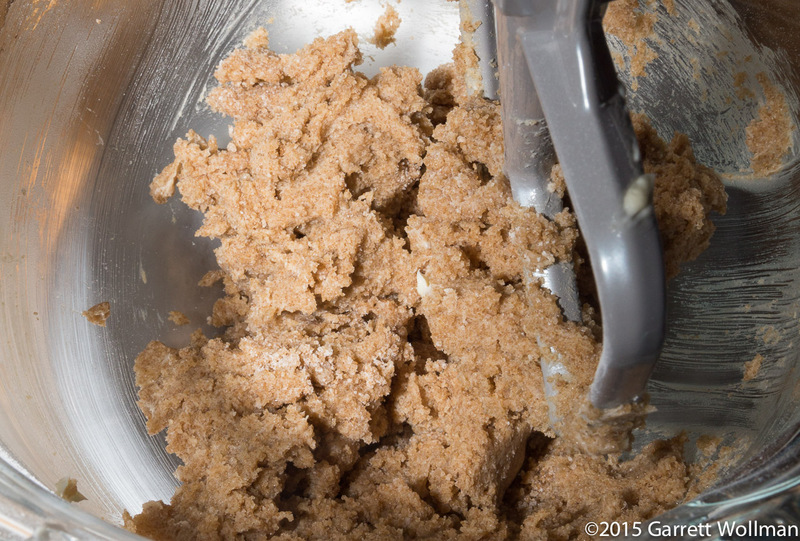 (The mixing bowl and whip must be scrupulously clean — I washed the bowl by hand while the cake was baking.) At this stage, room-temperature butter is whipped in, a few tablespoons at a time — Chang’s recipe calls for an enormous quantity of butter, six whole sticks worth (that’s 24 oz or 680 g). A few of my tasters complained that the frosting was too buttery, and this is certainly a much higher ratio of butter to meringue than in the Italian meringue buttercream featured previously on this blog. 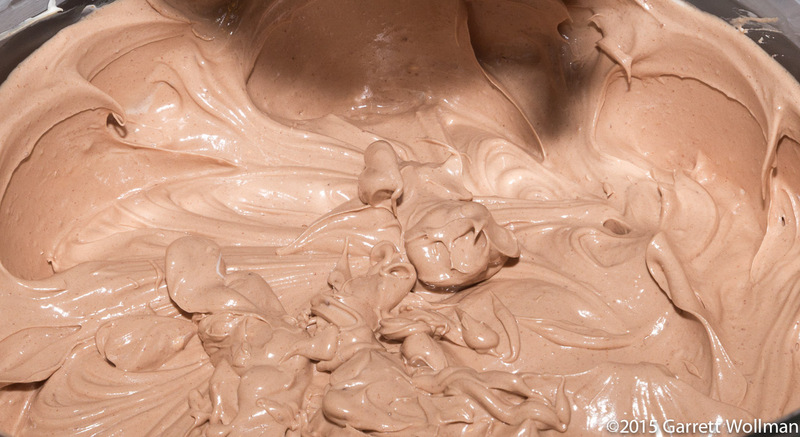 Once a smooth buttercream is formed, we switch to the stand mixer’s paddle attachment to beat in the cooled milk-chocolate ganache and a half-tablespoon of vanilla extract. The result is a lot of buttercream. The tare weight of this mixing bowl is 3.1 kg, so the actual mass of buttercream I ended up with is about 1420 g. (If you add the masses up, you may be wondering what happened to the egg whites — the law of conservation of mass-energy says it can’t have disappeared! Some of the water must have evaporated, but I’ve suspected for some time that my butter is actually a bit underweight.) 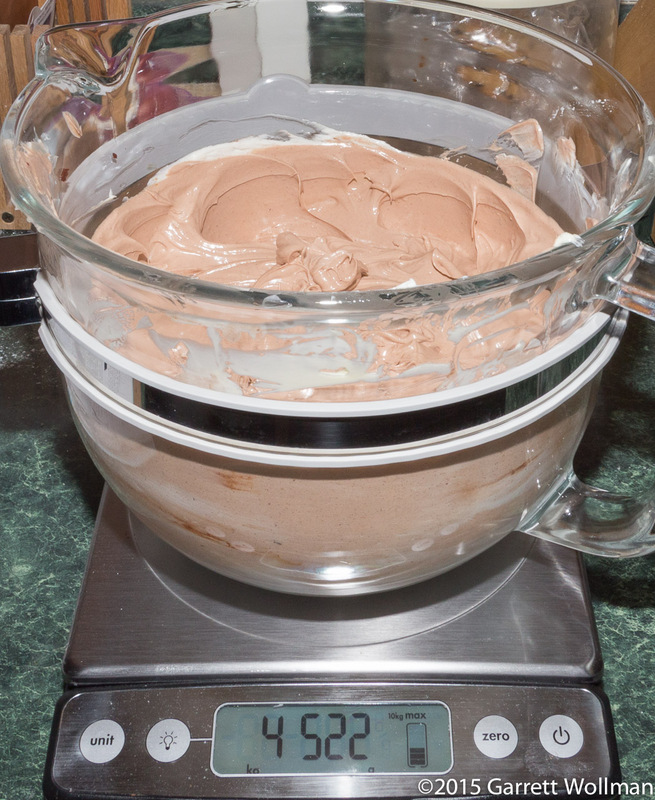 In any event, that’s a little bit over three pounds of frosting — I decided, somewhat arbitrarily, to call it 50 ounces for the purposes of nutrition computation, although it’s closer to 53 ounces in reality. With the frosting done, it was time to depan, trim, and split the cake. I didn’t do a great job of cutting even layers, as you can see: I clearly should have grabbed my 1″×2″ fence pickets (an old Alton Brown suggestion) from the pantry to use as slicing guides, but alas I did not think of that. Nor did I remember to cut a witness notch in the side of the cake so that I would be able to line the layers up evenly after filling. I’ve never had much ability at cutting anything flat, although it looks like I didn’t do too bad a job on the dome-removal operation. 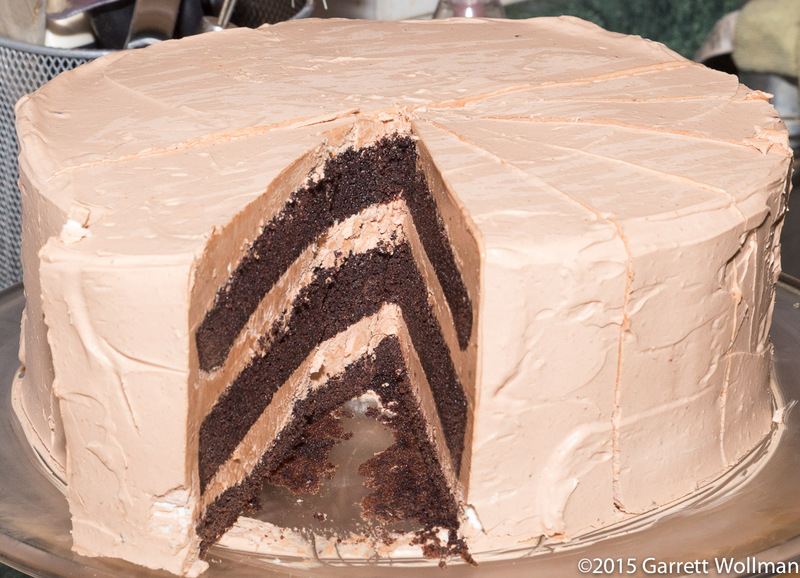 Let’s just have one more look at that luscious milk-chocolate buttercream, shall we? I used an old bakers’ trick to glue the bottom layer of the cake to the cake stand, to keep it from sliding around while applying the filling and frosting: just use a dab of frosting in the center of the plate. You can’t really see it from this angle, but the cake does get noticeably thinner towards the back end. The actual texture of the crumb is absolutely lovely, even if it does seem a bit dry upon eating (something I noticed as I was munching on the leftover dome). Probably cake strips plus a slightly shorter baking time would have resolved that issue. Chang says to use about 1½ cups (360 ml) of buttercream to fill each layer. I put my Adjust-a-Cup measure to good use making sure to use enough, but not too much, filling. You’ll notice that I managed to tear the top layer, despite having used my cake lifter to move the layers around, but frosting covers up a lot of sins. 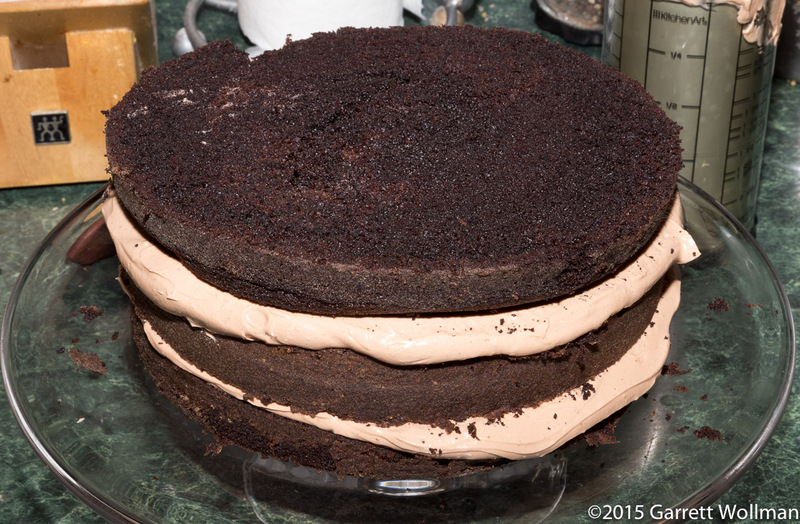 At this point I have applied another cup of frosting to the top and sides of the cake, forming a crumb coat. 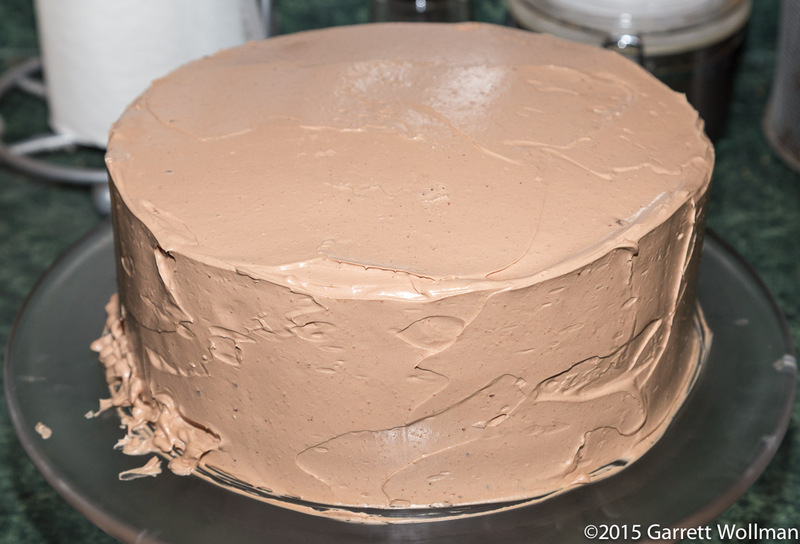 I put the cake into the refrigerator for half an hour at this point to set the frosting (lumps, ridges, and all). 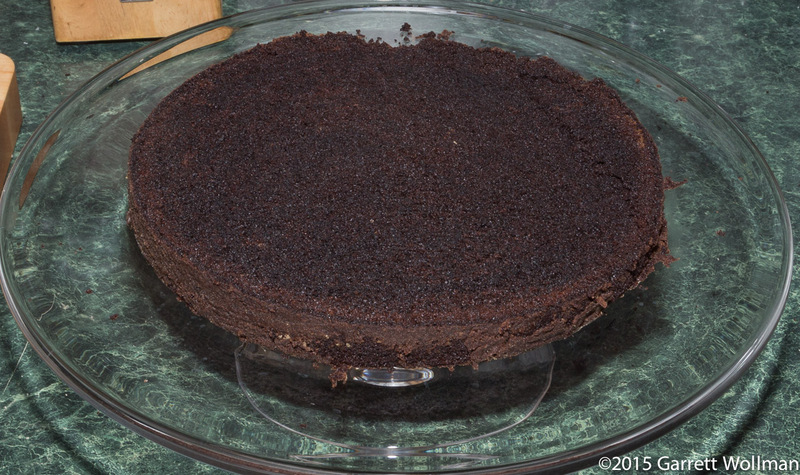 A crumb coat is rather more important on a crumbly chocolate cake like this, as it prevents the dark crumbs from migrating through the lighter-colored frosting and showing up on the finished surface. Tuesday morning I got up and sliced half of the cake, using my (freshly sharpened) chef’s knife to cut through the solidified buttercream filling, rather than the serrated slicer I normally use. Rinsing the knife in hot water after every couple of slices and then wiping it dry allowed me to make clean, smooth cuts with a minimum of tear-out. You can see clearly in this view how uneven the layers actually were, but I don’t think anyone else noticed. (It’s the sort of thing that bothers me, but you can’t actually taste an uneven cake layer, after all!) 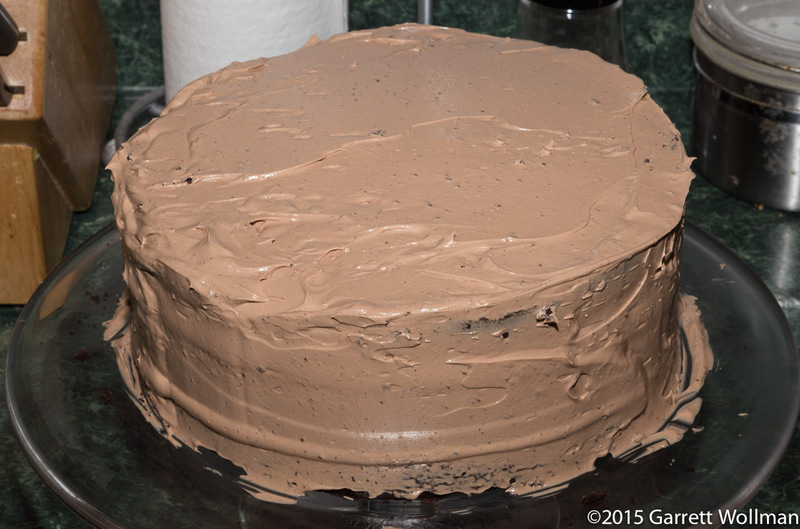 There are a few white spots where the milk-chocolate ganache didn’t quite get completely mixed into the buttercream. Overall? The cake itself is fabulous. For the whole assembly, cake and frosting together, the calorie toll is rather high — I might make this cake again but use a different, lower-calorie filling like raspberries or cherry jam, and a different frosting. The frosting was not by any means bad, in fact most people quite liked it, but even by buttercream standards it was a bit rich, and the grittiness was definitely a surprise given the smooth and creamy outward appearance. Gallery | This entry was posted in Food and tagged buttercream, cake, chocolate, Joanne Chang, layer cake, recipe. Bookmark the permalink.